At a recent yoga event I got to talking with one of the prominent yoga teachers and we somehow got on a subject of personal yoga practice. “Nowadays it is as little as I can get away with”- he said. That made me feel sad, mostly because I realized that I was adopting a similar attitude lately. And this is not where I want to be. In the past 18 years my personal yoga practice had carried me through both mundane and challenging times. Over the years my practice has evolved, expanded and contracted based on the issues I was dealing with, but I always knew that I could come back to it any time to move, breathe and reassess. My yoga teacher Gary Kraftsow always encourages consistent yoga practice. He often compares regular home yoga practice to flossing. He jokes that you should only floss around the teeth that you want to keep. You floss to both get rid of the waste (food particles) and to keep your teeth and gums healthy. Similarly, regular home practice helps you let go of things you don’t need (tension, sluggishness, restlessness, etc.) and keeps you healthy and more content. And ultimately, of course, it helps you see the bigger picture beyond the mundane, and connect you to something larger then yourself. For yoga teachers regular home practice becomes more of a necessity. As yoga teachers, we are not only responsible for our own sense of wellbeing, but also for the kind of energy and attitude we bring to our students. And since we cannot teach what we do not have, it would be disingenuous to encourage our students to develop a home yoga practice if we are skipping our own. My teacher also encourages us to keep records of the home yoga practice. “You don’t have to write a novel, – he says – but jotting down a few notes on what the practice was about and how it felt, helps keep it alive and relevant.” Keeping notes of your yoga practice is particularly useful if you are trying to investigate a specific set of practices, test certain techniques or consistently work on a chronic problem. So this is why I created the Personal Yoga Practice Journal. It is my effort to support you (and myself!) in developing or reigniting your home yoga practice. 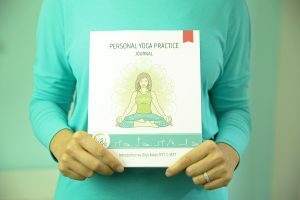 The Personal Yoga Practice Journal will help you build your yoga practice into your day and keep track of your progress. You can plan the direction of your yoga practice for the next month using the 30 DAYS OF YOGA planning pages, or you can record your practices day-to-day, attending to the needs that arise. The Journal gives an overview of two foundational yogic models: The Panchamaya Model (Five Koshas) and The Age Model. The Panchamaya Model is an excellent yogic guide that describes five main layers of the human system, what it takes to have balance on each one of those levels, and which tools are most effective for achieving that balance. The Age Model describes each life stage and yoga practices that are the most relevant to each stage. The Journal also describes ten types of yoga practices based on the things that you wish to accomplish. Your yoga practice needs to be purposeful, and choosing the right practice will help you get the best results. Your yoga practice is not something separate from your daily life; it can become its integral part. It can become the support structure that gives you physical stability, consistent energy and a focused mind to enable you to do whatever it is you want to do with your life. It can also become a safety net that will catch you when life gets rough. The new year is fast approaching, which gives us a great opportunity to jump-start or invigorate our home yoga practice. You can get your Personal Yoga Practice journal here and let’s get started! The Personal Yoga Practice Journal helps you create and record your home yoga practices. I’ve been keeping a yoga journal since I started practicing with this site! It’s nothing fancy, just a daily planner where I write my practice and my sensations in the notes next to each day, and so far I’ve never gone back to read what I wrote, but I hope that one day it will be useful to me. If not, just writing it down makes me feel accomplished. That’s fantastic Pinkie! You are absolutely right – even if you never read what you wrote, actually putting the pen to paper to record your experience helps you process it, I think.